All text, unless otherwise noted, Herne photo and title graphics - © copyright Allen W. Wright, 2004. Robin of Sherwood photos are © copyright Spirit of Sherwood and are used with permission. For a more in-depth look at this series I conducted two interviews. Series creator Richard Carpenter shares his thoughts on RoS. Mark Ryan (Nasir) offers many insights on playing the first Muslim Merry Man, the filming of the series and the Pagan elements of the show. I also created a Robin of Sherwood timeline which others have expanded on. Richard Carpenter, the creator of Robin of Sherwood, passed away on Feb. 26, 2012. This article was originally written in the early days of my website. I'm busy writing a new and considerably larger article about the show -- one of my favourite versions of the legend. 2015 Update: Robin of Sherwood will be returning as a special audio drama next year produced by Barnaby Eaton-Jones and executive produced by Spiteful Puppet, who are also responsible for the award-winning Hood series of audio dramas. As for the script, it's adapted from a film script written by series creator Richard Carpenter. The surviving members of the cast, including Jason Connery, Judi Trott and Ray Winstone are returning. I hope to finish the thoroughly updated article by then. You can help fund the project on their Indiegogo campaign by following this link. All proceeds go to the Sherwood Forest Trust and the British Red Cross -- Richard Carpenter's favourite charities. 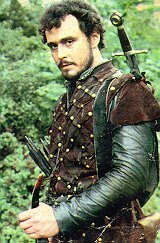 In the interests of full disclosure, I should say that my whole website would not likely exist if it weren't for the Robin of Sherwood television series. Oh, I had loved the legend since childhood. I had read books, seen films, cartoons and Christmas pantos starring Robin Hood - and even dressed as him for Halloween - long before Robin of Sherwood was ever filmed. In fact, I first saw the show immediately after I finished an in-depth high school project on the history and development of the legend. What Robin of Sherwood did was rekindle my love of a childhood favourite in my teenage years, and keep my interest in the Robin Hood story alive until the world wide web was truly born. On more than a few occasions, I've mentioned my website to a group of strangers, and someone will ask about "this Robin Hood TV series that was on back in the 1980s". They ask me about it like they are the only ones in the whole world to remember it. They aren't. I get more e-mail about Robin of Sherwood than any other version of the legend. Quite a few people fondly remember this series. But it shouldn't be so surprising that casual viewers have the feeling that no one else has heard of the series. Time and again, articles, documentaries and the like skip over Robin of Sherwood like it never existed. And yet, this show has informed nearly every version of Robin Hood to come afterwards. Kevin Costner's Prince of Thieves borrowed so much from Robin of Sherwood, but even on the recent DVD commentary track, Costner and director Kevin Reynolds act like everything lifted from RoS was new to their movie. Okay, they do mention Robin of Sherwood in their making-of special, but mainly just to note that two generations of Connerys have played the role of Robin Hood. If imitation is truly the sincerest form of flattery, then Robin of Sherwood must be one of the most flattered filmed versions of the legend ever. Oh, the Errol Flynn movie The Adventures of Robin Hood still dominates in the public eye, and all Robin Hood movie makers either borrow from or consciously depart from the Flynn film (oftentimes they do both). Even "Robin Hood and the Sorcerer", the double-length first story of Robin of Sherwood (RoS for short), owes a debt to Flynn. The difference is that most people are aware of the influence of Errol Flynn. I think many of RoS's contributions to the legend are known only to the filmmakers, TV producers and novelists who do the borrowing, and to RoS's dedicated core of fans. As almost an afterthought, a Saracen warrior named Nasir joined Robin's band in Robin of Sherwood. Mark Ryan's performance as Nasir obviously left an impression as an Arab Merry Man has appeared in many versions since Robin of Sherwood, most notably Morgan Freeman's character in the 1991 film Robin Hood: Prince of Thieves starring Kevin Costner. Also, Ray Winstone's portrayal of Will Scarlet as a near-psychotic, angry rebel influenced Christian Slater's Will Scarlet in Prince of Thieves and was even more completely borrowed in Jennifer Roberson's novel The Lady of the Forest. 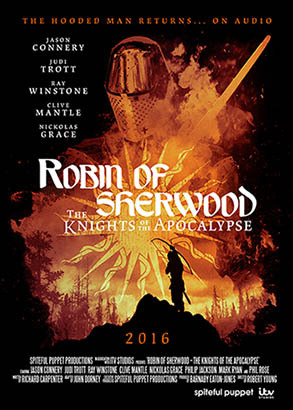 And while magic has been a part of the Robin Hood pantomimes for nearly two hundred years, the prominent fantasy element in Robin of Sherwood has inspired the magic in Prince of Thieves, The New Adventures of Robin Hood TV series and many other post-RoS versions. Yet in the mainstream media, all these innovations have been credited to Prince of Thieves, an inferior and later movie. This makes me feel very protective of Robin of Sherwood. Oh, if you were to say "Robin Hood" to me, I'd most likely see Errol Flynn in my mind's eye, but deep down I feel that Robin of Sherwood is my Robin Hood. This TV series (which, by the way, was not made by the BBC and was instead shown on the British commercial channel ITV -- something that most North American video guides get wrong) was the brainchild of Richard Carpenter, a creator of many notable British children's series. Carpenter wrote all the episodes in the first two series and half of the third series. His writing is one of the show's many strengths. Robin of Loxley is chosen by Herne the Hunter (a stag-headed spirit first mentioned in Shakespeare's The Merry Wives of Windsor, but inspired by various European horned gods and Wild Huntsman legends) to be a protector of the English people. Michael Praed played this role with a beautiful fey quality. You could believe that his Robin was almost messianic, subject to visions and in touch with divine forces. When Praed left at the end of series two, the show did not merely re-cast the part of Robin of Loxley. Instead Robin sacrifices his life to save Marion (played by Judi Trott) and his foster brother Much (Peter Llewellyn Williams). Herne (John Alberini) summons Robert of Huntingdon, an earl's son, to become the new Robin Hood and carry on the good fight. Jason Connery played the second Robin Hood with a more down-to-earth quality. The cast is superb. Scenes of the band training or at play (oftentimes this is the same thing) shows a real bond among Robin's band. Clive Mantle's Little John is especially good at silently showing his love for his comrades-in-arms. The series also boasts one of the toughest Marions on film, played by Judi Trott. She can outshoot everyone but Robin himself. And of course, there's Ray Winstone as the loveable tough guy Will Scarlet. Nickolas Grace plays the oily, political Sheriff of Nottingham and the late Robert Addie is his blustering and bullingly lackey Guy of Gisburne. RoS also features many guest villains, played by actors such as Richard O'Brien and Anthony Valentine. And then there's soundtrack by Clannad. Robin Hood historian Stephen Knight calls it "somewhat Celtic, distinctly electronic, vaguely hallucinatory." It's available with the rest of Clannad's albums under the title Legend. (Not to be confused with the soundtrack for the movie called Legend.) The music won the show an award, and on a personal note, sparked my interest in Celtic music. 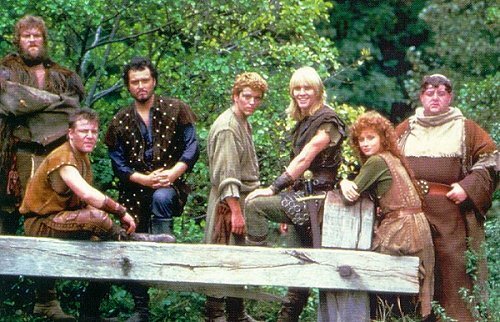 I discovered Robin of Sherwood on PBS in the late 1980s (it had originally been played on the US cable network Showtime). This show rekindled my interest in all things Robin Hood. (It also kindled my interest in a classmate, a fellow fan, but hey I was young and foolish.) I owe this series a tremendous debt. Time has moved on since my original review. The Playhouse video advertisements for Robin of Sherwood proudly declared how modern the show was by saying it is "Robin Hood for the 1980s." And that's all very well and good, back when the 1980s actually were modern. But that decade's come, gone and been transformed into the same kind wacky nostalgic tributes that Happy Days and Sha-Na-Na were for the 1950s. So, perhaps I shouldn't be so surprised by what now seems dated. I used to think that the show's defining and strongest element was the magical subtext. It was so different than most other Robin Hoods I was familiar with. 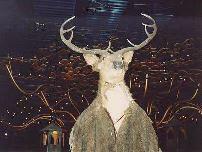 But the 1980s New Age spirituality has become increasingly dated, and let's be honest - Herne's antlers never were in fashion. Friends of mine have shown Robin of Sherwood to their classes, and the magic almost always provokes laughter. And yet, there's something about RoS that stays current and modern. With hindsight, I can see the strengths of the show are the same strengths that exist in nearly any drama: compelling characters, sharp dialogue, humour to balance the drama, and a point. The show has something to say, a purpose - but not in a hamfisted Captain Planet way. These qualities never date. Look for some revisions coming soon. 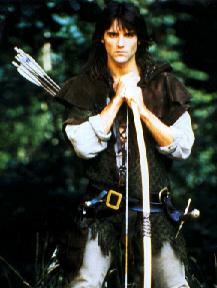 I began by saying that the Robin of Sherwood is one of the most imitated versions of Robin Hood. While RoS was influenced by what came before as well -- and not just by old ballads. The once-much reprinted children's novel by Evelyn Charles Vivian contains much that will seem familiar to the fans of Robin of Sherwood. The sheriff and abbot are called Robert and Hugo de Rainault. A villainous "Belame" plots to marry the Kirklees-bound Marian. Marian's father, a secret prisoner, is rescued while Robin saves a captured Merry Man. There are attacks made with beehives, swords on a string, and much more. However, it does lack the true magic of RoS, both literal and metaphorical. This gorgeous edition from Chronicle Books is illustrated with art from woodcuts, centuries' worth of Robin Hood book illustrations, comic book art (the cover art is from the 1950s Classics Illustrated comic book), shoe advertisements and more. It's worth it for the art alone. In the Europe, Network Video has released the series on DVD in the UK. In 2007, Acorn Media released the series for Region 1, North America with nearly all the same special features as the UK versions. In 2011 and 2012, Network and Acorn released the series on Blu-Ray. Robin of Sherwood: Set One. This North American release contains all the Michael Praed episodes and most of the special features found on the European releases. Robin of Sherwood: Set Two. This North American release contains all the Jason Connery episodes and most of the special features found on the European releases. Robin of Sherwood: The Complete Collection. This North American release contains all the Michael Praed and Jason Connery episodes and most of the special features found on the European releases. Robin of Sherwood Blu-Ray: Set 1. In 2011, Acorn released the Michael Praed episodes on North American Blu-Ray. Although the picture is intentionally grainy at times, the quality is superior to the DVD. It shares the same special features of the earlier release and also includes new featurettes with Philip (Abbot Hugo) Jackson, George (Richard of Leaford) Baker and director Robert Young, and also PDF files such as Carpenter's early outline for the series. Robin of Sherwood Blu-Ray: Set 2. In Feb. 2012, Acorn released the third season (the Jason Connery episodes) on Blu-Ray. Buy Robin of Sherwood on PAL-format DVD or Blu-Ray (Not Playable on most North American players) on Amazon.co.uk. The DVDs include special features like documentaries, blooper reels and commentary tracks with the writers, directors and (on episodes from the 3rd series) cast. Legend by Clannad. The soundtrack from the Robin of Sherwood TV series. This music by one of Ireland's finest bands won a BAFTA award. It's mystical Celtic music with a touch of rock. Clannad: Live in Concert. This concert album includes an 11-minute Robin of Sherwood medley with a few snatches of music not found on the Legend album. Visit my RoS timeline, a guide to the confusing continuity of the series. If you're interested in seeing the series or in joining the official RoS fan club Spirit of Sherwood, please write to Christine Haire Alexander at ChrisRHood@aol.com. Here are some of the many websites dedicated to Robin of Sherwood.